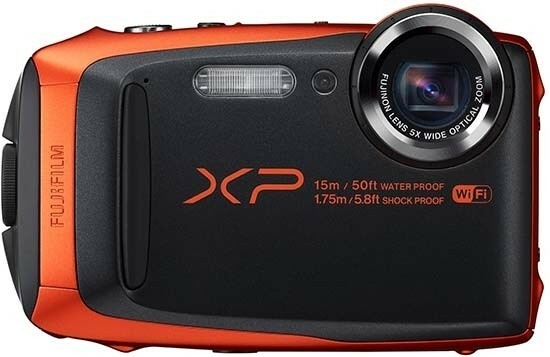 The FinePix XP90 replaces last year’s XP80 to become FujiFilm’s flagship (and since the discontinuation of the XP200, only) toughened and waterproof compact camera. As is often the way with new compact cameras, the XP90 isn’t actually all that new. It boasts identical toughness credentials to the XP80, being waterproof to 15m/50ft, shockproof to a height of 1.75m/5.8ft, freezeproof to -10°C/-14°F, as well as dustproof. Much of what’s underneath the toughened exterior is also carried over from the XP80, so the new camera gets the same 16.4 million pixel 1/2.3-inch CMOS sensor, paired with a sealed 5x optical zoom lens giving a focal range equivalent to 28-140mm. The lens also retains optical image stabilisation. 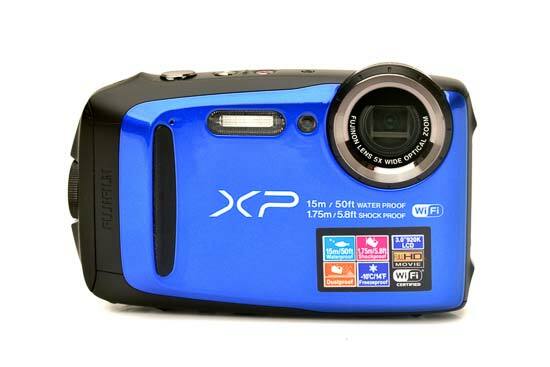 The only significant improvement made to the Fujifilm FinePix XP90 is a new 3-inch, 920k-dot LCD screen. Its extra features have been seen before on the XP80, but they are fairly extensive. You get Wi-Fi connectivity for remote camera control and easy image sharing, plus an interval timer for shooting time-lapse sequences. Full HD video capture is also available, as is high frame rate video recording. The Fujifilm FinePix XP90 can be had for around £149/$179, undercutting the cost of rival toughened cameras like the Canon PowerShot D30, Nikon Coolpix AW130, Olympus Tough TG-4 and Ricoh WG-30. Apart from some minor styling tweaks, the Fujifilm FinePix XP90 follows the outgoing XP80’s outward appearance. It’s unashamedly plastic, though the build quality is high and there’s no flex or obvious weak points. The only slight issue if we’re nit-picking is the prominent lens bulge, which is a magnet for chips and scratches if the camera is dropped. The XP90’s ergonomics are also hard to fault, with a good sized front finger grip and a textured thumb rest on the back. Even the shutter release is textured so it’s easier to press when underwater, however the video and playback buttons are very small and the latter is especially tricky to press when wearing gloves. At 109.6mm x 71mm x 27.8mm, the XP90 isn’t exactly svelte, but its chunky size is great when you’re in the thick of the action or under water, and the 203g ready-to-shoot weight is reasonable for a toughened compact. A single door covers the battery and memory card slots, and it’s secured by a rotating dial lock and safety button. Some waterproof cameras use two separate catches instead, but Fujifilm's locking system is marginally more convenient while still protecting the flap from being opened accidentally. The Fujifilm FinePix XP90's control layout is much the same as the XP80, with the rear panel being especially similar, though there’s a more noticeable difference when you power the camera up. The XP80’s 2.7-inch, 460k-dot LCD screen has been replaced by a 3-inch, 920k-dot device for a crisper viewing experience. The new display also boasts superb viewing angles, while brightness is high enough to maintain easy visibility under direct sunlight. The only thing missing is touch sensitivity, but that’s not really surprising as capacitive touch screens won’t work properly when wet. The increased screen resolution helps display Fujifilm's clear menu interface at its best. This is split into two tabs: a shooting menu spread over three pages, and a set-up menu covering five pages. With so many pages of camera options, it isn’t easy to remember where to find any one setting. Splitting the camera’s settings into additional categories would make for faster, more logical camera control. It’s also a pity that there isn’t a separate menu containing frequently used camera settings to avoid entering the main menu for almost every function change. 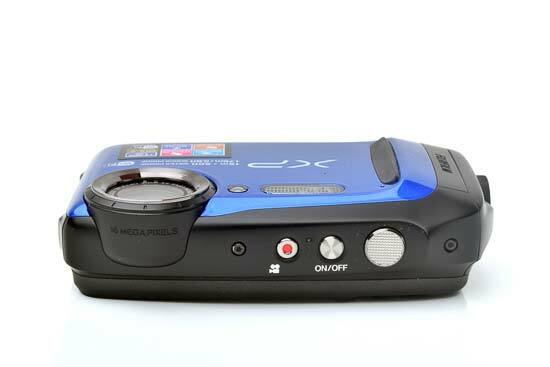 Alongside the new screen there are two buttons for controlling the XP90’s 5x optical zoom, which is unchanged from the XP80 and provides an acceptable – though not particularly wide – 28mm-equivalent maximum wide angle focal length. As with many waterproof cameras, the zoom button feel quite vague and spongey, though they function fine. The directional pad on the rear panel doubles as controls for the flash, macro focussing, self-timer and exposure compensation. The latter enables +/-2EV of exposure control, while the self-timer features 10 or 2-second delays, plus a group timer option, and then there’s that interval timer. The interval timer allows you to set the Fujifilm FinePix XP90 to record images over a duration of up to six hours, with shots fired every 3, 5, or 10 seconds, up to a minimum frequency of 10-minute intervals. It’s a useful feature for shooting time-lapse sequences, and if you select the Time-Lapse Movie option from the main menu, the XP90 will convert the recorded images into a video with a resolution of up to 1920x1080 and a frame rate of 60, 30, or 10fps. The only drawback is the XP90’s NP-45S rechargeable Li-ion battery, which is carried over from the XP80 and is rated for the same 210 shots per charge. That won’t be enough to power lengthier time lapse sequences, and it’s not really enough for normal shooting, especially when compared with the Nikon Coolpix AW130 that’ll manage 370 shots per charge. Back to the XP90’s controls and you’ll notice that there’s no mode button. There are in fact 22 different shooting modes, but you’ll need to access them via the Menu button on the rear panel, which reveals the shooting modes as the first menu option. The default Scene Recognition Auto mode is accompanied by a plain Auto mode that functions almost identically, as well as a Programmable auto mode where you can set options like ISO sensitivity, white balance, and autofocus mode (centre, multi-point and tracking modes are on offer). The mode menu also contains the usual selection of scene modes, but more interestingly you get a multi-shot HDR setting, as well as a sweep panorama mode and three different night scene options (see the Image Quality section for examples). Underwater and Underwater Macro modes are also present, helping to remove any colour casts when shooting at the deeper end of the camera’s 15-metre depth rating. 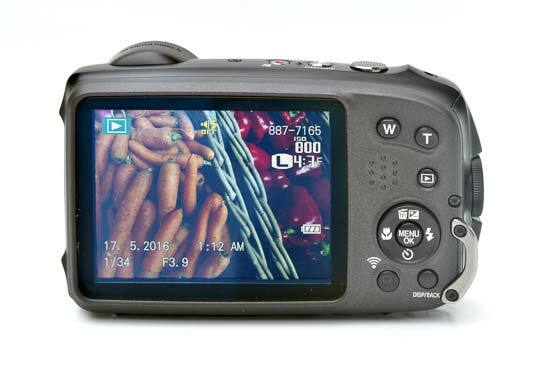 The last button of interest on the Fujifilm FinePix XP90 is the Wi-Fi button at the bottom of the rear panel. By downloading the Fuji Camera Remote app – available for iOS and Android – you can remotely control the XP90 and transfer photos from it to your smart device. The system lets you download a full resolution photo in around five seconds, and it boasts a decent amount of remote control options. You can zoom at two speeds with almost no signal lag, as well as remotely control self-timer and flash options. The app will also let you switch between stills and video shooting. The only niggles are a lack of NFC pairing, and some slight lag between pressing the remote shutter release and the XP90 actually capturing a shot. During conventional shooting, the Wi-Fi button instead activates the XP90’s burst capture mode. At full resolution, the XP90 can shoot at up to 10fps for a 10 frame burst, or it’ll capture 70 frames at up to 60fps if you drop the image size to Small, Widescreen (1920x1080). However, in both cases you still get only around one second of capture time. If that’s not long enough, the XP90’s will shoot a 30-second burst of video at 120fps at 640x480 resolution, or 240fps at 320x240, and it maxes out at 320fps, albeit at a tiny and virtually unusable 160x120 resolution. 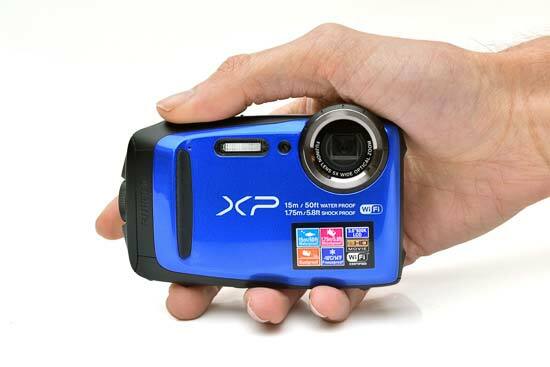 The Fujifilm FinePix XP90 powers up almost instantly, though you’ll need to wait two seconds before a shot can be captured. Autofocussing in good light isn’t quite instantaneous, but it’s nippy enough and also reliable. However when things get dim there’s some noticeable focussing delay, and the camera often fails to focus, especially in night-time conditions.